A customer within the rail industry required a product to house sensitive electronic equipment. The component required complex machining to tight tolerances with a specialised coating finish to electronically passivate it. 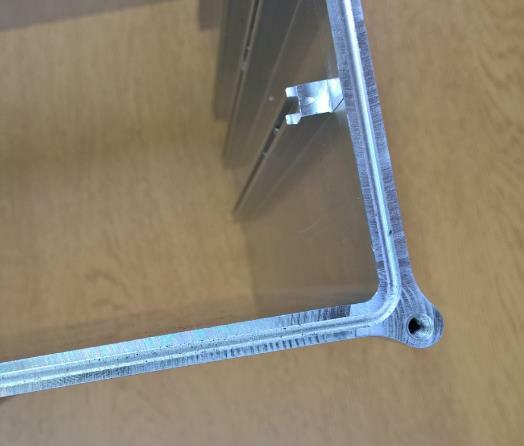 Our engineering team worked alongside one of our large profile extrusion specialist suppliers to determine the best and worst case deviations on form to the agreed tolerance specifications. From this data, bespoke machining programs were created to individually modify each machining cycle to match the variations in extrusion. This allowed machining detail to +/-0.1mm to be achieved into the end of a ‘box’ profile with dimensions of over 260mm x 168mm with a wall thickness of over 5mm. Bespoke inspection processes were put in place to inspect the machining, matching to customer check gauges and to verify the passivation coating on 100% of the parts supplied. Inspection reports are generated, confirmed as complying and Certificates of Conformity released for 100% of the parts on every delivered batch.